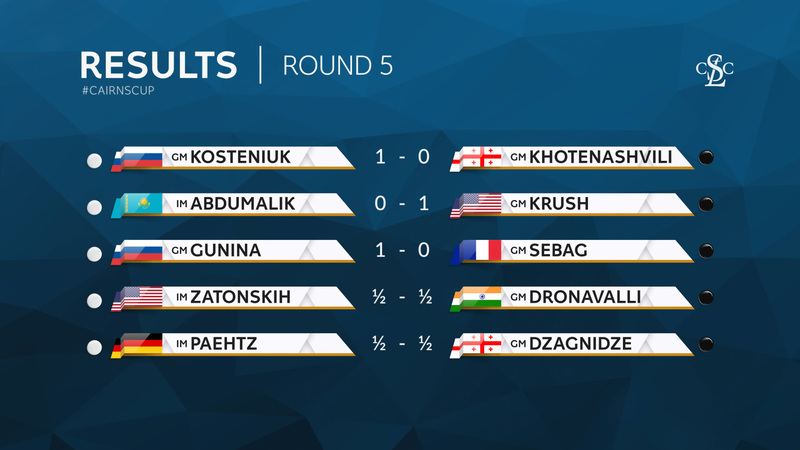 The 5th round certainly didn’t lack excitement, and the three leaders continued to show their fine form by extending their respective leads. 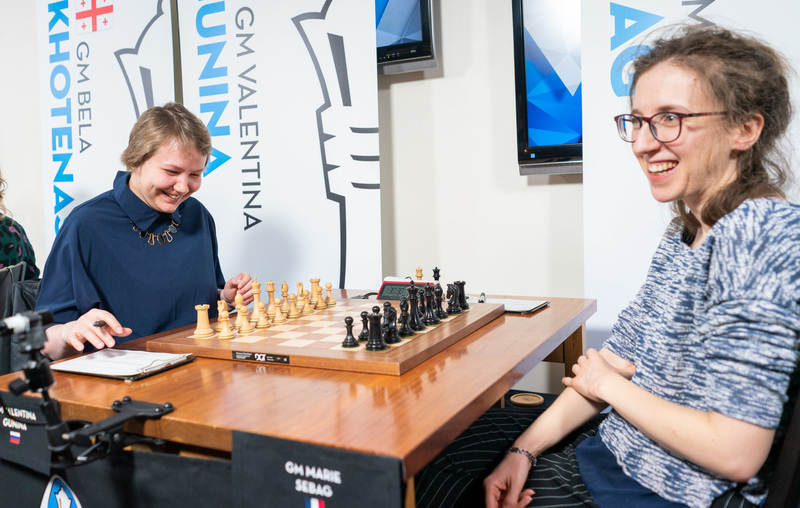 Valentina Gunina won a spectacular game, Irina Krush won an efficient one, and Kosteniuk won after an absolutely crazy battle. 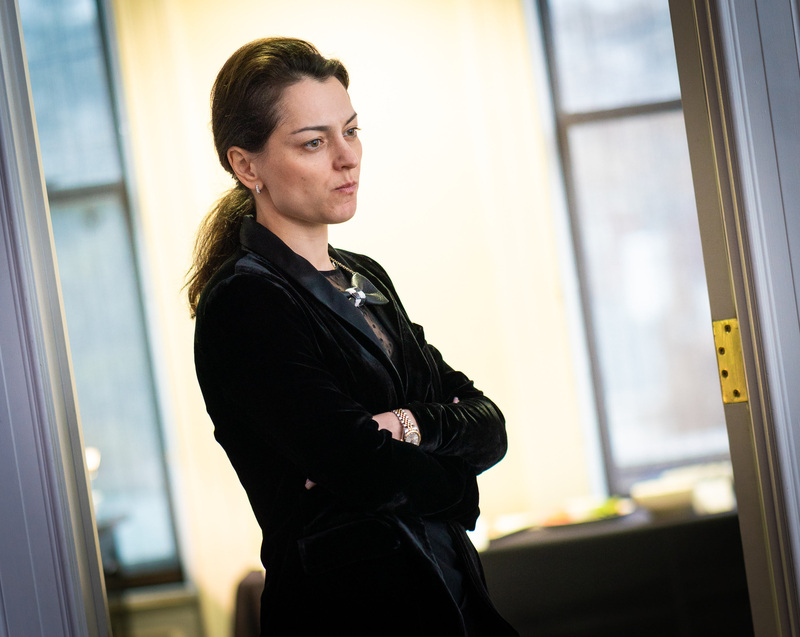 Anna Zatonskih recovered from a terrible pawn blunder, leaving Harika with a 5th draw in a row. Here are the results and a breakdown of the action. As Bela mentioned in the confessional booth during the round, Alexandra had only played 1. E4 against her in the past, and thus had surprised her by opening with the queen’s pawn. Nevertheless, in the resulting Grunfeld position it was clear that the Georgian GM’s feel for the position was somewhat better, and she ended up getting a slightly more comfortable position with the Black pieces. Kosteniuk played a strange-looking maneuver with her knight to c7, followed by Ra5, and soon enough the game turned into an absolute mess. Neither side had much time on the clock and the position was a mess, but they navigated the position well considering the circumstances. Bela didn’t allow one perpetual when most probably she should have, however, she then later refused a draw when Alexandra was much better! The former women’s world champion was quite unforgiving this time, and ground out an exchange up ending without too many troubles. This brings Kosteniuk to an incredible 4.5/5, while Bela is stuck at one point and will look to come back in the 2nd half of the event. Irina’s choice of the Caro-Kann seemed to be a wise one, as Zhansaya soon played a slightly controversial f4 move and weakened her central light squares. This lead to a comfortable position for Black with some excellent positional trumps. Krush’s own suspect pawn move, however, came on on the 14th move when she chose the move b5. This allowed Abdumalik to get counterplay with b3-Ba3. Zhansaya failed to capitalize on her chances, however, and soon enough Irina retook the advantage with a powerful idea of 22… b4 which busted White’s structure completely. Irina was absolutely unforgiving after that, and reeled in the point convincingly. This puts Krush at four out of five, while Abdumalik moves back to 50%. These players were both in the mood for sharp play, as indicated by White’s choice of the Nb3-g4 idea against the Najdorf. Both players burned up lots of time in the opening, and ended up in a super complex position with chances for both sides. Marie erred with 20… Qd7 and afterwards Valentina took the initiative and never surrendered it. She found several exemplary moves, including 23. G6! and 24. Bxh6!! Valentina capped off her masterpiece with the final blow 30. Rf8+ forcing a beautiful mate in two. Easily the game of the tournament, and a masterpiece that will be remembered for a very long time. Marie’s bad luck continues, while Valentina moves to an impressive four out of five and is in prime position going into the rest day. 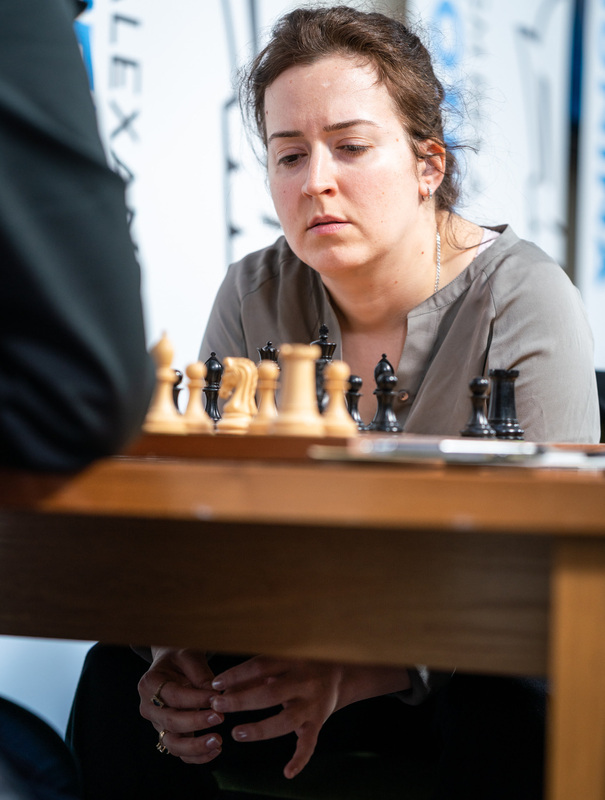 Harika chose a somewhat unusual Nimzo / Queen’s Gambit Declined hybrid to surprise Anna early, but the American IM handled herself well and came out of the opening with a comfortable edge. Anna perhaps played e5 prematurely, and Harika’s extremely astute 17… Nb8 gave her excellent counterplay with the idea of c5-Nc6. Disaster struck for Anna soon thereafter, as she blundered a pawn with 21. Ne4. Harika didn’t overlook 21… Nxe5! taking advantage of an overloaded rook on e1 that cannot guard e4 and d1 at the same time. Harika’s technique looked strong for awhile, but she traded the last pair of rooks prematurely, and then Anna seemed to have a firm grasp on a draw, and she achieved it without too many headaches. Harika must be disappointed not to have converted her pawn and draws her 5th game in a row, while Anna has to feel fortunate to have survived her blunder. In a sharp Najdorf, Dzagnidze missed a chance to punish Paehtz for an inaccurate move order in the opening, and as a result ended up under pressure herself. While it looked as if Elisabeth could maintain her advantage by keeping the tension, after she took on f6 her pressure seemed to dissipate and the position was roughly equal. Paehtz seemed to recapture an advantage by capturing a pawn after a couple inaccurate moves by Dzagnidze, but ultimately she was unable to do anything with her extra pawn. They repeated around the 40th move, and while Elisabeth might still have chances to win in the final position, if you don’t see any ideas, it is hard to continue to play. Elisabeth has drawn a few games after a tough start, while Nana remains at -1. There is a rest day on Monday the 11th, then the players are at it again on Tuesday at 1pm local time. 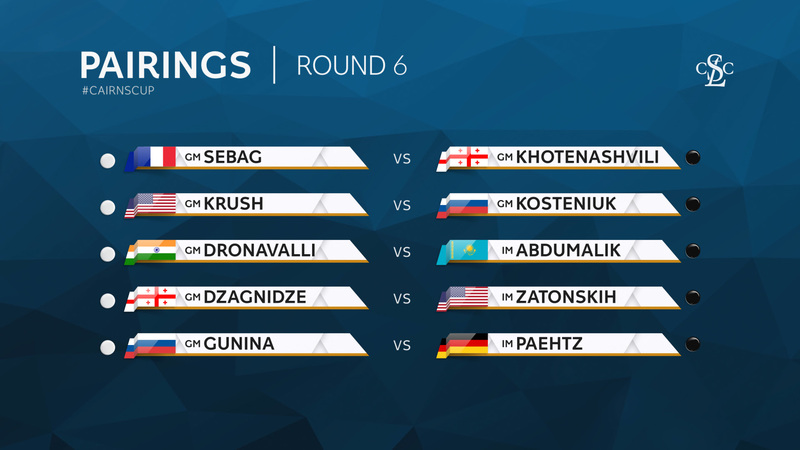 Round six pairings are pretty juicy, in particular with Krush and Kosteniuk doing battle. Make sure to tune in! with computer analysis LIVE on ChessBomb.